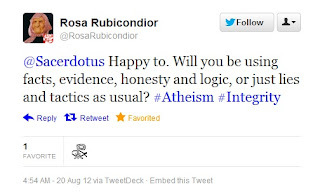 Atheists claim to be rational, intelligent and logical; however, Twitter Atheists have shown otherwise. They resort to childish games. @Rosarubicondior is an example. 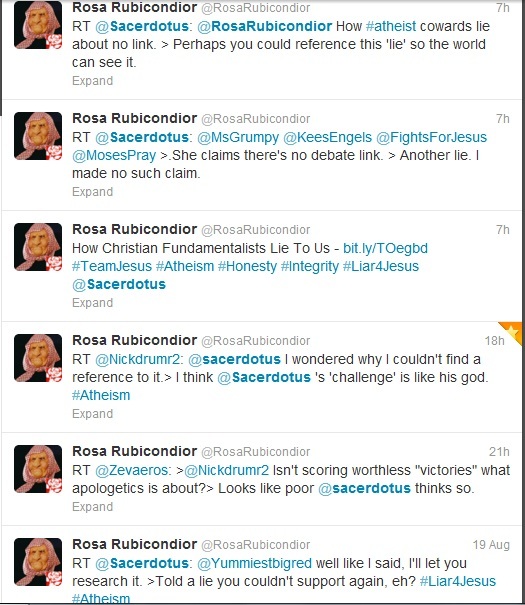 Here are some of the many tweets showing the delusion and denial. 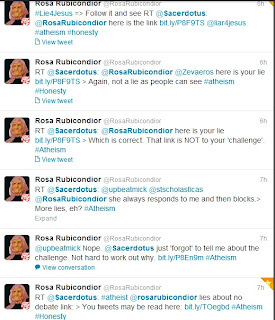 2) She has serious mental issues and uses Twitter as an outlet for attention. After the engagement last night, it is most probable that the latter is the situation at hand. 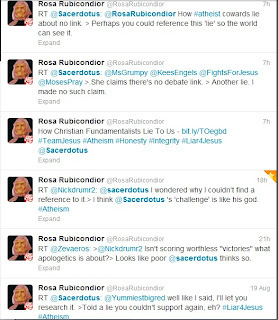 Rosa Rubicondior demonstrated signs of denial. Denial is a defense mechanism that is activated in the human mind when the mind encounters a fact that is too strong to process and accept. The mind then replies by rejecting it even when hard evidence is present. Rubicondior seems to be the type that likes to be heard. She will immediately block anyone who gives her a counter argument to her premise. This is sad indeed because it shows a lack of intellectual confidence. It makes her look like a fool instead of a rational person. 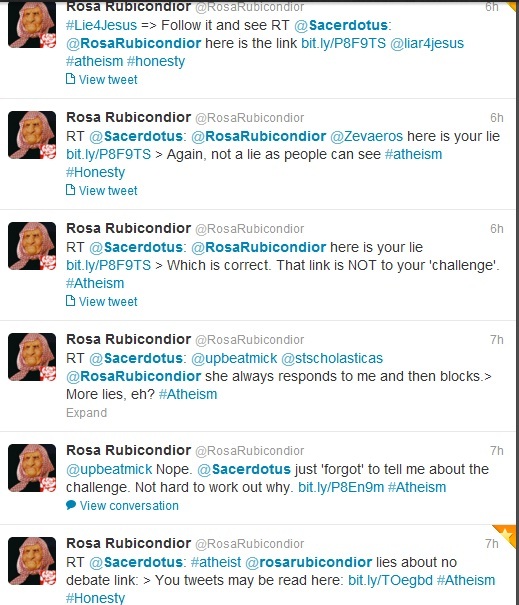 Rosa is being dishonest by presenting herself to be a champion for Atheism and at the same time running away from defending it. 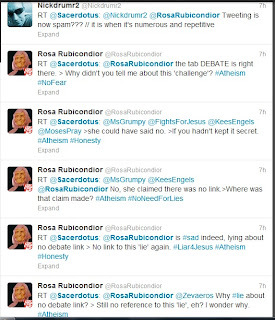 Her behavior makes Atheism look like foolish rhetoric that cannot be defended when tested against logic and reason. 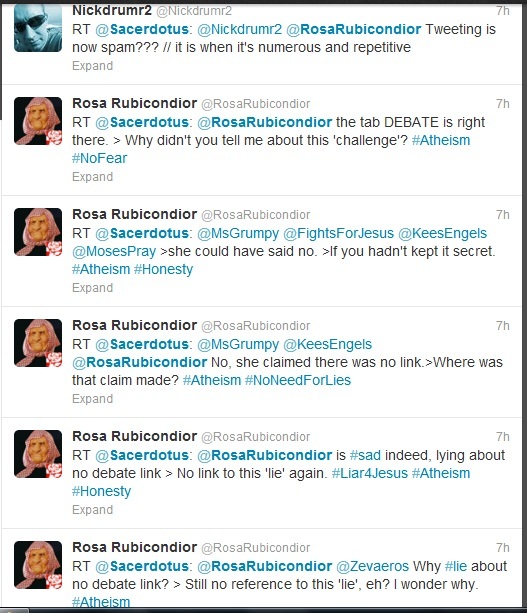 She is no Christopher Hitchens who always took up any challenge. He debated anyone and defended Atheism even if he was made out to look like a bigoted misogynist fool. I was expecting more from Rosa than these childish games. She claims to be a Biologist but does not grasp basic Biology based on her blog. Numerous times I had to correct her. She ignores and just deletes my comment which offers the correction. Is this what Atheism has been reduced to? A bunch of charlatans looking to bait and play games instead of engaging in a serious discussion that has been around since man's first steps. Let's see if she follows through and not try to pull a rabbit out of a hat or make a disappearing act.